We’d love your help. Let us know what’s wrong with this preview of Bigger than a Bread Box by Laurel Snyder. To ask other readers questions about Bigger than a Bread Box, please sign up. What is the book's reading level? Autumn This books reading level is Accelerated Reader Level: 4.3. Your parents can't solve all of your problems. Sometimes your parents cause all of your problems. The same goes for magic! This book (written by me, so I'm not exactly objective) attempts to weave together elements of a real childhood (mine) and amazing magic. Because I still believe in both. As much as I loved PENNY DREADFUL, I think this is my favorite Laurel Snyder book yet. Heartbreaking, hopeful, and full of magic, it's the story of a girl whose life changes when the lights go out and her parents have one last argument before her mother loads the kids into the car and drives out of the state. When they land at her grandmother's house in Georgia, Rebecca has to deal not only with her parents' separation but also the angst of a sudden move, switching schools, and then...a magical As much as I loved PENNY DREADFUL, I think this is my favorite Laurel Snyder book yet. Heartbreaking, hopeful, and full of magic, it's the story of a girl whose life changes when the lights go out and her parents have one last argument before her mother loads the kids into the car and drives out of the state. When they land at her grandmother's house in Georgia, Rebecca has to deal not only with her parents' separation but also the angst of a sudden move, switching schools, and then...a magical breadbox that backfires? My heart ached for Rebecca, trying to navigate the stormy waters of a newly broken family while taking care of her little brother and dealing with questions of her own about who she wants to be at her new school. BIGGER THAN A BREADBOX is hard to explain - yes, it's about a magic breadbox and divorce and seagulls and Bruce Springsteen and friends - but it's one of those books that is somehow greater than the sum of its parts. Middle grade readers - especially those who have been through a parental separation - are going to read this one, love it, and hold it close for a good long time. I have always loved fantasy books. I dream that I could teach at Hogwarts and own a dragon. When I was young, I dreamed about what I would wish for if I was granted three wishes. I knew all the pitfalls in those be-careful-what-you-wish-for plots, and I knew I could do it right. My daydreams were fanciful, but what I wished for most would never come true. It was just as implausible as my flying carpet, magic wardrobe, make me invisible fantasies-- I wished my parents weren't divorced and that we I have always loved fantasy books. I dream that I could teach at Hogwarts and own a dragon. When I was young, I dreamed about what I would wish for if I was granted three wishes. I knew all the pitfalls in those be-careful-what-you-wish-for plots, and I knew I could do it right. My daydreams were fanciful, but what I wished for most would never come true. It was just as implausible as my flying carpet, magic wardrobe, make me invisible fantasies-- I wished my parents weren't divorced and that we could live as a family, again. In Bigger Than a Breadbox, Rebecca has the same wish for her family, and the magical breadbox she finds can't solve this problem for her. More than a wish story, Laurel Snyder has crafted a touching and sadly familiar story about a family in crisis. Like the best fantasy stories, Bigger Than a Breadbox is about people and the choices they make. The magic only provides complications. What do we really want in our deepest hearts? We wish we could see the people we love after they have passed on. We wish we could take back hurtful things we've said. We wish we could be young again. We wish we could be heard. We wish our broken lives could heal. Nothing that will fit in a breadbox can really answer our heart's desires. I voiced this audio edition of my own recent novel, and it was an amazing experience. I cried while recording it. I wonder if you can tell where! I strongly enjoyed this book because the book has more meaning than what meets the eye. For example, in the book, after having to leave her father due to divorce, Rebecca finds a magical breadbox that can bring her whatever she wants whenever as long as it fits inside the box. Though, later in the book she realizes that the items provided is being taken from innocent strangers. I think this is foreshadowing her parent’s divorce. For example, there may have always been problems between her parent I strongly enjoyed this book because the book has more meaning than what meets the eye. For example, in the book, after having to leave her father due to divorce, Rebecca finds a magical breadbox that can bring her whatever she wants whenever as long as it fits inside the box. Though, later in the book she realizes that the items provided is being taken from innocent strangers. I think this is foreshadowing her parent’s divorce. For example, there may have always been problems between her parents, but they went unnoticed, like how the breadbox always stole from strangers, but Rebecca wasn't aware. Furthermore, after her mother realized where all her anger was coming from and how she didn't like how she was being treated was when she left her husband, which is similar to how when Rebecca found out where the items from the bread box were coming from and she forced herself to stop using it. Rebecca's parents aren't getting along and haven't been for some time. The day after her parents have a huge fight, Rebecca's mother takes her and her little brother Lew from their home in Baltimore to Atlanta to visit their grandmother. It is not until they arrive that Rebecca learns this "trip" is going to last indefinitely, and that her mother has already enrolled her into a new school there (It's worth mentioning that this trip occurred only a month or so after the start of the new school year.) Predictably, Rebecca struggles with her disrupted home life, and with getting along in a new school. However, she is able to ignore a lot of these angsty issues when she discovers a magical bread box in her grandmother's attic. So, magical bread box, eh? I like that this item is completely unexplained, and the rest of the story has no paranormal elements. Basically, Rebecca can make a wish for any physical item, that is no bigger than a bread box, and it will appear in said box. Problems arise when Rebecca begins to explore where exactly these items come from, and what the implications are of her having them. But here is where the mixed messages arrive. Is this a story about children of divorce and separation? A story of being true to yourself? A moral tale which cautions that material items do not solve problems? Or that large issues take more than a thoughtless quick fix? I was loving this story a lot until I reached the end and realized how much of Rebecca's plight went unresolved. Her family is still a bit of a mess. There is no big revelation there. And regarding the breadbox, problems were created when she used it, and problems were created when she tried to undo what she had done. So the lesson is....what? This is a cute, well written story with believable characters. However, I wanted a little more at the end. As it is, it felt more than a little incomplete. Or maybe, as a person whose parents never divorced there is something more to this that is over my head? Either way, it is a solid two stars for me. As an adult reader, it feels like a perfectly-drawn portrait of a temporary melancholy. I'm anxious to hear how children respond to it. But also other adults. We all have a lot of baggage we're going to bring to this book. This truly is a delightful romp of a story that shows wonderful imagination and great sensitivity. Rebecca is a sympathetic protagonist, at a point in her life where what mom says goes, and is whisked away from her father, her home, her friends, quite unexpectedly one afternoon, along with her two-year-old brother Lew. It is a shocking, frustrating, turn of events that quickly tests all of Rebecca's restraint to forgo throwing tantrums and take what life is throwing at her in stride instead. That's a huge order for a twelve year old girl, and she doesn't always succeed. Then life becomes really interesting when she stumbles upon a bright and sparkling breadbox in her Gran's attic. For this isn't just any breadbox; this is a magical item that grants wishes (as long as said wishes meet one important criteria; that they are not bigger than said breadbox of course). Rebecca Shapiro is 12, lives in Baltimore with her parents and younger brother Lew (2), and is working on her math homework when the lights blink off and her family comes apart. Within days, her mother has packed the car and driven herself and both kids to her mother's house in Atlanta, while she figures out her life. This sudden uprooting is disastrous for Rebecca, who is angry at her mother and at her own helplessness. The only good thing--or so it seems at first--is a breadbox, one of many, f Rebecca Shapiro is 12, lives in Baltimore with her parents and younger brother Lew (2), and is working on her math homework when the lights blink off and her family comes apart. Within days, her mother has packed the car and driven herself and both kids to her mother's house in Atlanta, while she figures out her life. This sudden uprooting is disastrous for Rebecca, who is angry at her mother and at her own helplessness. The only good thing--or so it seems at first--is a breadbox, one of many, found in the attic. It has the power to grant wishes that adhere to certain restrictions; above all, the objects wished for must actually exist in the world. Much of the plot structure comes from the working out and exploitation of this magic item's powers, as Rebecca uses the candy, food, and gift cards provided by the bread box to buy herself popularity at her school in Atlanta, and then sees that popularity, and more, undone as the exact nature of how the item works, especially the fact that it takes items from elsewhere in the world to give them to Rebecca, becomes clear. In fact, there is a nice connection made between this and the Greek philosopher, Epicurus, who briefly appears as an answer on a test Rebecca takes about halfway through the story. This limitation on the magic's power becomes downright harrowing with a certain spoon Rebecca gets for her mother, a gift that leads the novel in a most unexpected direction. That unexpected direction is indicative of Snyder's refusal to take easy paths in this story. The little old lady in the messy house is kind and lonely until that spoon hits the scene and she reacts with a pathetic and heart-wrenching fury, something rare for middle-grade fiction. The girl you think will become Rebecca's best friend and ally at her new school, doesn't. Not for any obvious reason, but simply because Rebecca is too emotionally wrecked to pursue friendship and the girl, Megan, is too cowed by the school mean girls, led by one Hannah. Megan's main role is to provide Rebecca background about Hannah, whichcomplicates rather than simplifies the task of sorting people into black hats and white hats. Snyder does a good job of anticipating and defusing the most obvious criticism a reader might have: because the bread box is magic, why doesn't Rebecca simply demonstrate this fact to any of the various people who become mad at her as a result of objects provided by the box? The bread box is the engine that powers the plot, but the story is concerned with how real people make a mess of their lives and how difficult--sometimes impossible--it can be to undo the damage. At the end, Snyder gives a final unexpected move when Rebecca considers destroying the troublesome box. This is a path frequently chosen in stories that feature magic in an non-magical world--even Prospero destroys his ability to use magic by the end of The Tempest! Instead, Rebecca decides to take the bread box back to Baltimore, sensibly deciding that it might come in handy in some situations. Our pick for the 2011 Newbery Award. ESP: So it’s a book about a magic bread box? Is that how you would describe it? Not just about a magic bread box. It’s about school drama, family, and how unfair it is when adults make decisions for you that you don’t like. ESP: How did the book make you feel when you were reading it? I was excited and on edge! I couldn’t guess what was going to happen at all. She (Laurel Snyder) did a great job with the entire story. Our pick for the 2011 Newbery Award. I was excited and on edge! I couldn’t guess what was going to happen at all. She (Laurel Snyder) did a great job with the entire story. There wasn’t too much of anything or too little of anything. It was a perfect book. The ending is a good set up for a sequel, hint-hint! Like PENNY DREADFUL before it, BIGGER THAN A BREADBOX has the charming old-fashioned feeling of middle-grade stories from the 60s, but with a contemporary bend. Rebecca's parents' sudden separation forces her to move to Gran's house, where she discovers a magical breadbox that seems to produce anything she wishes for from thin air. But as is always with wishes, something is amiss. This simple magic-realist story is really about a girl trying her best to deal with some of the toughest parts of gr Like PENNY DREADFUL before it, BIGGER THAN A BREADBOX has the charming old-fashioned feeling of middle-grade stories from the 60s, but with a contemporary bend. Rebecca's parents' sudden separation forces her to move to Gran's house, where she discovers a magical breadbox that seems to produce anything she wishes for from thin air. But as is always with wishes, something is amiss. This simple magic-realist story is really about a girl trying her best to deal with some of the toughest parts of growing up, and grappling with some important ethical questions in the process. 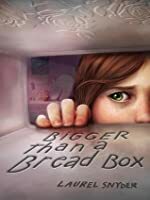 Be careful what you wish for definitely holds true for Rebecca, main character of Bigger Than A Bread Box by Laurel Snyder. Rebecca is uprooted from her Baltimore townhouse by her mother who decides to separate from her dad and live in Atlanta with Grandma. Rebecca doesn’t have an easy go of it as a new kid until she finds a magical bread box in the attic. There are so many things to love about this book. Rebecca is a likeable and realistic heroine, and I really enjoyed the fact that the book always stays centred on her story. She has a lot going on, but it's really up to her to figure out how to make things right. There are no fairy godmothers, and wishes don't just fix everything that's going wrong. This is a perfect book for a little girl, and would be a perfect choice for a mother-daughter book club. I like Laurel Snyder's magic the best. The magic in this book reminded me a lot of her book Any Which Wall. She makes magic seem possible. I love how her characters have to figure out the magic-understand its rules and limitations. This book is great on so many levels. I need to say more, but must take some time to process this amazing read. Can't think of a better book to end my summer with. I love this one. Great unique, fun story. Great book. Very real and very magical all at the same time. Definitely a book I will read to my class. Rebecca's life was suddenly torn apart when her parents reached a breaking point. One moment, their life in Baltimor The holidays can add a stress to anyone's life, but particularly for families coping with divorce. Change is hard for anyone, but particularly for children. 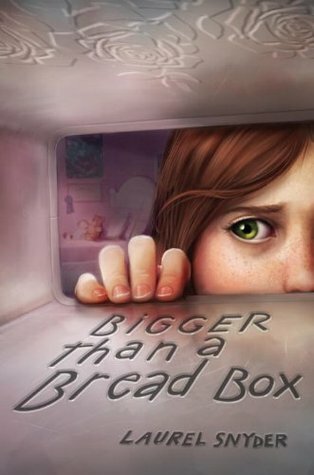 I was particularly struck by Laurel Snyder's newest book, Bigger than a Bread Box, by how change can wrench a child from all her certainties. This is a wonderful book for kids who love realistic fiction, with a hint of fantasy. For a few of my early adult years, I veered away from such books, issuing a blanket dismissal of "kids'" books and assuming that any adult books with hints of fantasy were not for me. I was, after all, a high-minded fan of literary fiction and didn't need magic in my books. Luckily I returned to my roots several years back and began to explore books written for kids or adults that have a healthy bit of magic. My favorites are ones like BIGGER THAN A BREAD BOX, where magic is certainly central to the plot but is not the main focus. In this poignant story, Rebecca Shapiro, age 12, is acutely and painfully aware of the trouble in her parents' marriage. As astute and intelligent as she is, it's extremely difficult for her to understand why her parents can't resolve their troubles and why they can't all simply live together. Author Laurel Snyder is so gifted when it comes to portraying the thoughts and actions of a middle school girl, one who is very smart and focused but who may mask those qualities because she still wants to fit in. One who is deeply affected by the troubles her family is going through but who doesn't want anyone else to know what she's going through. When Rebecca finds a way to make some of her wishes come true, she acts as most of us probably would: wishing for selfless things as well as selfish ones, making both bad and good choices in an attempt to make her family whole. She eventually figures out, at least for now, how to best cope with her magical gift, but there's more to come: to my complete surprise, the novel contains a riveting and suspenseful climax I never saw coming, one that kept me up late into the night to read. Rebecca loves her life in Baltimore even though she realizes that her parents are fighting a lot now that her father is between jobs. After her father forgets her mother’s birthday, her mother packs Rebecca and her brother Lew up and moves them in with their grandmother in Atlanta. Hiding in the attic after she realizes that her mother means for this to be a long term visit, Rebecca finds a collection of breadboxes. One of them is not dusty like the others, and after wishing that she had somethi Rebecca loves her life in Baltimore even though she realizes that her parents are fighting a lot now that her father is between jobs. After her father forgets her mother’s birthday, her mother packs Rebecca and her brother Lew up and moves them in with their grandmother in Atlanta. Hiding in the attic after she realizes that her mother means for this to be a long term visit, Rebecca finds a collection of breadboxes. One of them is not dusty like the others, and after wishing that she had something to read, and finding a book in the bread box, she decides to take it to her room. There, she discovers that the bread box will deliver most of what she asks for-- money, food from Baltimore, an iPod, etc. What it won’t do is provide her with a way to get her parents back together. After asking for a one-of-a-kind jacket like the meanest of the mean girls has at school, Rebecca starts to realize that all of the things must come from somewhere, and she has essentially stolen all of them. She attempts to get the things back, including a special and valuable spoon that she has asked for for her mother’s collection. The spoon belonged to an elderly lady, and returning it causes big problems. Rebecca’s parents attempt to work things out, and while Rebecca isn’t sure if they can do that, the family will at least go back home, without the aid of the bread box. Strengths: More of my students are wanting magical realism, and this would certainly fit that bill. Snyder’s writing is very effective. This is one of those books that should be in every school library. So many kids will relate to the protagonist, 12 year old Rebecca, whose parents are in the middle of a separation. Laurel Snyder nails the voices of her characters, and elegantly conveys the sorrow, anger, and helplessness felt in the middle of a family breakdown. I think it is perfect for school libraries because it is NOT didactic. There's no moralising, no patronising or promising, no prettying up (or judgment) of Rebecca's fe This is one of those books that should be in every school library. So many kids will relate to the protagonist, 12 year old Rebecca, whose parents are in the middle of a separation. Laurel Snyder nails the voices of her characters, and elegantly conveys the sorrow, anger, and helplessness felt in the middle of a family breakdown. I think it is perfect for school libraries because it is NOT didactic. There's no moralising, no patronising or promising, no prettying up (or judgment) of Rebecca's feelings and responses. The focus is not on her or her parents, but on the weirdness of her new circumstances. Rebecca feels displaced and foundering in her new reality. (The recurring sea gulls aptly hint at this 'lost at sea' feeling throughout). The story's wrap-up is satisfying and hopeful without being trite. In this story, Rebecca is aware of the magic she's stumbled upon. She thinks about it and even exploits it. She labels it magic. In some ways, I prefer a quirkier touch, where the magic is an 'oddly accepted oddity' and not emphasised so distinctly or called 'magic', e.g., The Strange and Beautiful Sorrows of Ava Lavender. When I approached Bigger than a Breadbox, I was hoping for a fun magical realism book, full of escapism. Instead, I got more realism than magic and it was an unpleasant reality as well. The book is told in first person perspective of a teenage girl, Rebecca, whose parents are undergoing a painful separation. Her mother tears her from her Baltimore home and brings her to Atlanta to live with her grandmother for awhile. Rebecca experiences what is normal when someone gets uprooted from her home: lo When I approached Bigger than a Breadbox, I was hoping for a fun magical realism book, full of escapism. Instead, I got more realism than magic and it was an unpleasant reality as well. The book is told in first person perspective of a teenage girl, Rebecca, whose parents are undergoing a painful separation. Her mother tears her from her Baltimore home and brings her to Atlanta to live with her grandmother for awhile. Rebecca experiences what is normal when someone gets uprooted from her home: loneliness, anger, sadness. She discovers a bread box in her grandmother's house that has the power to grant her anything that can fit inside of it: money, an iPod, a bus ticket. For me I found the book to be a curious read. I kept having the feeling that the story really wanted to be a realistic story about divorice. Unfortunantely there was the magical element of the bread box that jammed itself into the story. The divorice and the magical bread box seemed to be at odds with each other and caused the story to fall flat. It was okey story and there was nothing objectable to it. It just didn't have any sparkle for me. A younger more forgiving reader might find more in th For me I found the book to be a curious read. I kept having the feeling that the story really wanted to be a realistic story about divorice. Unfortunantely there was the magical element of the bread box that jammed itself into the story. The divorice and the magical bread box seemed to be at odds with each other and caused the story to fall flat. It was okey story and there was nothing objectable to it. It just didn't have any sparkle for me. A younger more forgiving reader might find more in the story then I did. For me I would have preferred the story to either have been a magical fantasy journey or a realistic divorice drama. I would in end say it is more of a 2 1/2 star book. The book "Bigger Than a Bread Box" is phenomenal. It is about a young girl named Rebecca, and told from a first person perspective. In the book Rebecca finds a magic breadbox after routing threw her grandma's dusty attic. Her parents had just gotten a divorce and now her, her mom, and her younger brother were living up in Atlanta with their Grandma. A magic breadbox is anything and everything a girl would want after going through that, especially because it grants her every wish and desire. Now The book "Bigger Than a Bread Box" is phenomenal. It is about a young girl named Rebecca, and told from a first person perspective. 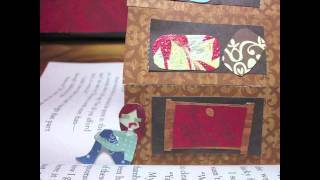 In the book Rebecca finds a magic breadbox after routing threw her grandma's dusty attic. Her parents had just gotten a divorce and now her, her mom, and her younger brother were living up in Atlanta with their Grandma. A magic breadbox is anything and everything a girl would want after going through that, especially because it grants her every wish and desire. Now all she has to do is keep it a secret! Wowza, what a book. I remember on twitter months ago Laurel Snyder tweeting about this book. About a 12 year old girl, Rebecca, whose parents have separated. How she's fled to Atlanta with her mom, baby brother, to stay at her grandmother's house while her mom sorts it all out. I remember Laurel mentioning Baltimore, seagulls, and Bruce Springsteen. I remember thinking, this book would be good for my students, but I didn't realize how good. Fifth grade tends to be an age where parents split up. I Wowza, what a book. I remember on twitter months ago Laurel Snyder tweeting about this book. About a 12 year old girl, Rebecca, whose parents have separated. How she's fled to Atlanta with her mom, baby brother, to stay at her grandmother's house while her mom sorts it all out. I remember Laurel mentioning Baltimore, seagulls, and Bruce Springsteen. I remember thinking, this book would be good for my students, but I didn't realize how good. One Wednesday morning Rebecca wakes up, walks down the stairs and sees her mother, packing. 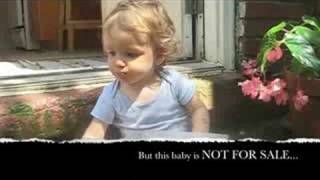 Her father is watching, sad and silent, and then Rebecca, her baby brother Lew, and her mother get in the car and leave. They drive all the way to Atlanta, to live with Gran, and Rebecca's doesn't talk to her mother the entire trip. Atlanta is...it's not awful, but Rebecca's sad and shocked and angry; and then Rebecca finds the bread box. It's just a tin box, red with roses painted on it, but when Rebecca One Wednesday morning Rebecca wakes up, walks down the stairs and sees her mother, packing. 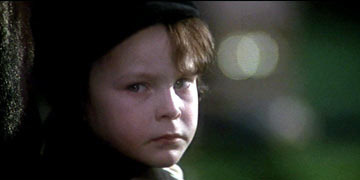 Her father is watching, sad and silent, and then Rebecca, her baby brother Lew, and her mother get in the car and leave. They drive all the way to Atlanta, to live with Gran, and Rebecca's doesn't talk to her mother the entire trip. Atlanta is...it's not awful, but Rebecca's sad and shocked and angry; and then Rebecca finds the bread box. It's just a tin box, red with roses painted on it, but when Rebecca makes a wish--a reasonable wish, a wish that can fit inside the box--whatever she asks for appears inside the box. Everything's easier, but box can't make her parents reconcile, can't deliver their family back to Baltimore, and then, suddenly, the box starts making everything much, much harder. This is the best kind of middle grade book. It draws you in with a lovable main character and intriguing magic, and then sucker punches you with emotional intensity and important life lessons. The magic of the bread box is extremely understated. I might not even call it magic for the most part. And the truth behind its tricks makes up the core of the story. Around that core are heartfelt, honest discussions of how divorce can affect kids and families, as well a painful portrayal of bullying. It' This is the best kind of middle grade book. It draws you in with a lovable main character and intriguing magic, and then sucker punches you with emotional intensity and important life lessons. The magic of the bread box is extremely understated. I might not even call it magic for the most part. And the truth behind its tricks makes up the core of the story. Around that core are heartfelt, honest discussions of how divorce can affect kids and families, as well a painful portrayal of bullying. It's also charmingly written, especially the relationship between Rebecca and her little brother Lew. The book was heartbreakingly short. I wasn't ready to give up the characters, or the magic at the end. It will leave you wanting more, but loving what you got. I can't think of the last time I was so tense reading a book, as I was reading the first half of Bigger than a Bread Box. I could barely sit still. So much foreboding, so much foreshadowing, that I just knew something big was going to go down. And when it did, when I saw it coming, I had to skim the chapter just to get a handle on it, before I went back and read it properly. Then I could breathe again for the second half until WHAM suddenly a huge surprise sprung up that I completely hadn't been I can't think of the last time I was so tense reading a book, as I was reading the first half of Bigger than a Bread Box. I could barely sit still. So much foreboding, so much foreshadowing, that I just knew something big was going to go down. And when it did, when I saw it coming, I had to skim the chapter just to get a handle on it, before I went back and read it properly. Then I could breathe again for the second half until WHAM suddenly a huge surprise sprung up that I completely hadn't been expecting and then I was all itchy and nervous again. Rebecca's parents are fighting. Again. But this time, her mom packs the car and takes Rebecca and her little brother to Atlanta to stay with their maternal grandmother. Rebecca misses her dad terrible, and doesn't like her new school at all. Seeing an opportunity to reinvent herself, she tries to do this, but it doesn't work out as well as she'd hoped. Meanwhile, in Gran's attic, Rebecca finds a mysterious box that appears to grant wishes. But how can a wish fix her parents' marriage? A great por Rebecca's parents are fighting. Again. But this time, her mom packs the car and takes Rebecca and her little brother to Atlanta to stay with their maternal grandmother. Rebecca misses her dad terrible, and doesn't like her new school at all. Seeing an opportunity to reinvent herself, she tries to do this, but it doesn't work out as well as she'd hoped. Meanwhile, in Gran's attic, Rebecca finds a mysterious box that appears to grant wishes. But how can a wish fix her parents' marriage? Laurel Snyder is the author of six children's novels, "Orphan Island," "Seven Stories Up," "Bigger than a Bread Box," "Penny Dreadful," "Up and Down the Scratchy Mountains OR The Search for a Suitable Princess" and "Any Which Wall" (Random House) as well as many picture books, including "Charlie & Mouse," "The Forever Garden," "Swan, the life and dance of Anna Pavlova," and "Baxter, the Pig Wh Laurel Snyder is the author of six children's novels, "Orphan Island," "Seven Stories Up," "Bigger than a Bread Box," "Penny Dreadful," "Up and Down the Scratchy Mountains OR The Search for a Suitable Princess" and "Any Which Wall" (Random House) as well as many picture books, including "Charlie & Mouse," "The Forever Garden," "Swan, the life and dance of Anna Pavlova," and "Baxter, the Pig Who Wanted to Be Kosher."